Discover Battery offers a premier line of maintenance-free Automotive MIXTECH batteries designed to provide better and more sustained performance in automotive and commercial start-stop driving applications. MIXTECH batteries are designed and manufactured with the award winning and patented German MIXTECH technology inside to provide longer battery life while meeting the growing demands of today's vehicles. 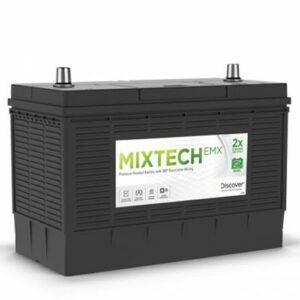 MIXTECH technology mixes the electrolyte inside the battery to ensure uniform acid density for greater charge acceptance and higher sustained performance throughout the entire life of the battery, and prolongs plate life and delivers exceptional clean and green power. Battery Central Brisbane is your local stockist of the range of Mixtech automotive batteries for passenger vehicles, commercial vehicles. Battery Central Brisbane’s onroad support can supply and fit Mixtech batteries roadside or at your home or business. If you own a European vehicle fitted with the Stop Start option, Battery Central can reset your computer with the Yu Fit Battery at the same time. We offer free in store fitting and free delivery in and around Brisbane, Logan and Ipswich (if fitting isn’t required).